Foreign Secretary William Hague spent nearly an hour on Twitter this afternoon answering questions about the “intervention” in Libya, at #askFS. See http://www.fco.gov.uk/en/news/latest-news/?view=News&id=649927082 for the transcript, just issued by the Foreign & Commonwealth Office. He got quite a hard time, with most of those tweeting seeming to be at best sceptical about this latest war. Including me. A childish oversimplification, and one that no-one truly believes. 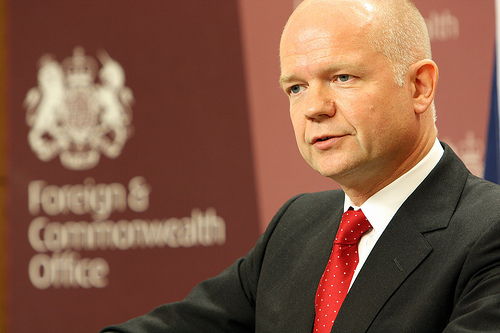 Hague’s Twitter-fest was touted as being a wonderful example of democracy in action. So democracy is being able to get a handful of 140-character answers to a large number of questions about complex issues. That’s our fast-food, sound-bite society for you. If you followed the exchange, you couldn’t help but notice that Hague answered only some of the questions posed. The published transcript of the session would suggest that his office selected a handful of the easier questions, to which Hague could repeat nice easy platitudes about massacres of innocents. + do you ever wonder that if Europe stopped selling so many weapons worldwide, you’d have less problems like #libya? + how can you pretend to humanitarian, despite the fact the UK has sanctioned arms sales to #Libya for the last 6-7 yrs? + how ironic do you think your name and the place you will be charged for illegal war crimes being one and the same is? + why was Britain still selling weapons to Arab dictatorships in February after the Arab spring had started? or at all. + so bombing libyas free schools/hospitals is helping them how exactly? It wasn’t all heavy political stuff though – there was some light relief from some wits who appeared to see Hague as a figure of fun that they could poke with a stick for the amusement of anyone hanging about on the internet. One asked: “What made you go into politics after you left Bronski Beat?” while another wanted to know if Hague ever regretted wearing “that” baseball cap. + what are your favourite biscuits? + What’s your 8th favourite Kajagoogoo song? + What’s the capital of Moldova? + do you agree that David Cameron looks a bit like C3PO but made out of spam? If not, why not? As you can imagine, these were among the many questions the Foreign Secretary left unanswered. So we’re no further forward in any respect. Anyhow, Hague signed off half an hour or so ago, apparently for a phone chat with the Libyan rebels, but the questions at #askFS continue to come in.